Are you looking for a Mathematics tutor? Master Maths takes beginners to GCSE level, making Maths easy. Ideal for students preparing for exams, and anyone brushing up their Maths. For the first time this Smart eBook is available for iBooks (iPad etc.) and all Kindles and Amazon tablets, and more. It is a Smart eBook. Each chapter starts like a traditional ebook, then comes alive when you get to the questions. You can answer the questions yourself by tapping your answer. It helps you by giving you hints and, if you need it, complete explanations. It teaches the many subjects in a quick, easy and effective way. Massive book: around 4110 Pages. Well-illustrated in colour. You can now see the many illustrations in full colour, but it is still works on black and white devices. Algebra, Geometry, Trigonometry, Statistics and Number are all covered. Part of the 'Master' range. It is now followed by the new Master Advanced Maths which takes you up to A-Level and AS-Level. It is written by G.Ludinski, a published author of many Print Books (all educational), such as the bestselling Brainteasers range of books. Have you forgotten the Spelling and Punctuation Rules you learnt at school? English Tutor takes beginners to GCSE (New GCSE as well). It is ideal for revising or work. Smart eBook. Uniquely you answer the questions yourself by tapping, and it marks them. If you are wrong, it gives you hints and explanations, if required. It teaches you the essential rules for writing good English in a quick, easy and effective way. It covers: Spelling Rules, Irregular Spelling, Punctuation Rules, Grammar and Spoken Language, Writing, and Reading and Comprehension. Easy to use. This colour ebook is even easier to use than before, as it is now available for all Kindles (Kindle Fire, Kindle, Kindle Paperwhite, Kindle Touch, and similar). This Mathematics tutor takes mature beginners or A-Level students to A-Level (18yrs) and AS-Level, making Maths easier. Ideal if you want to improve your Maths, or are revising. Smart eBook. Uniquely, you answer the questions by tapping, and it marks them. If you are wrong, it gives you hints and, if you need it, complete explanations. This comes after the Maths tuition. It teaches the many subjects in a quick, easy and effective way. Scoring. For the first time it even gives you a score. Massive book: over 3000 Pages. Well-illustrated in colour. For the first time this whole book is available for all Kindles (Kindle Fire, Kindle Paperwhite, Kindle etc.) and similar devices. Sequel to Master Maths. Though it is also a stand-alone book as important topics that are in both the GCSE and A-Level specifications are in both books. 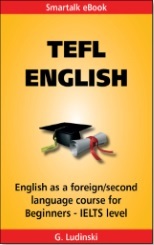 TEFL English teaches English (ESOL/EFL/English as a second language) to students, aspiring teachers, and teachers. Learn to speak and write English fast. Tap answers to the questions, and it marks them. Hear the words spoken if you have a Kindle Fire or similar tablet with sound. Translations into Chinese, Russian and Spanish are included. Many pictures are used for other first languages. Pictures of the mouth show you how to pronounce words. Over 2700 pages. Comprehensive educational resource. Smart eBook. Instruction and hundreds of questions are included. The user answers the questions by tapping the screen, and it marks them. Chinese, Russian and Spanish translations of the questions are included. These help students, who understand these most popular world languages, get started. Spoken English is taught, as the user can hear the words spoken, if a Kindle Fire or similar tablet with sound is used, e.g. all models of Kindle Fire, including the Fire tablet. There is no extra cost for this. Students can also see how to pronounce words and sounds, as pictures of the mouth (showing where the tongue should be) are used. Also available for all Kindles (black and white, or colour) and similar. Beginners to IELTS level. It covers Pronunciation, Listening, Reading, Grammar, Writing, Conversation, Vocabulary and much more. “Excellent all round. Many thanks”. For the first time this Smart eBook is available for iBooks (iPad, iPhone etc.) and all Kindles and Amazon tablets. With a Smart eBook you can tap the answers to the multiple-choice questions and it marks them. Now you can see this well-illustrated ebook in full colour. It teaches you about angles in 2D, 3D shapes and Geometry diagrams, and more, in a quick, easy and effective way. Ideal for beginners (from 8 years) to GCSE level (New GCSE too), students revising, and for work. This is Part 1 of the ebook Master Maths. Master Maths is written by a published author of many Print Books, and is based on the bestselling LCL course, Micro Maths PRO, for teachers and students. See above for examples of different customer reviews of this course from one of the two most popular shopping websites on the internet. For the first time this Smart eBook is available for iBooks (iPad, iPhone etc.) and all Kindles and Amazon tablets. With a Smart eBook you can tap the answers to the multiple-choice questions and it marks them. Now you can see this well-illustrated ebook in full colour. It teaches you in a quick, easy and effective way about the subjects listed and more. Ideal for beginners (from 8 years) to GCSE level (New GCSE too), students revising, and for work. This is Part 2 of the ebook Master Maths. Master Maths is written by a published author of many Print Books, and is based on the bestselling LCL course, Micro Maths PRO, for teachers and students. See above for examples of different customer reviews of this course from one of the two most popular shopping websites on the internet. This is Part 3 of the ebook Master Maths. Master Maths is written by a published author of many Print Books, and is based on the bestselling LCL course, Micro Maths PRO, for teachers and students. See above for examples of different customer reviews of this course from one of the two most popular shopping websites on the internet. This is Part 4 of the ebook Master Maths. Master Maths is written by a published author of many Print Books, and is based on the bestselling LCL course, Micro Maths PRO, for teachers and students. See above for examples of different customer reviews of this course from one of the two most popular shopping websites on the internet. For the first time this Smart eBook is available for iBooks (iPad, iPhone etc.) and all Kindles and Amazon tablets With a Smart eBook you can tap the answers to the multiple-choice questions and it marks them. Now you can see this well-illustrated ebook in full colour. It teaches you in a quick, easy and effective way about the subjects listed and more. Ideal for beginners (from 8 years) to GCSE level (New GCSE too), students revising, and for work. This is Part 5 of the ebook Master Maths. Master Maths is written by a published author of many Print Books, and is based on the bestselling LCL course, Micro Maths PRO, for teachers and students. See above for examples of different customer reviews of this course from one of the two most popular shopping websites on the internet. This is Part 6 of the ebook Master Maths. Master Maths is written by a published author of many Print Books, and is based on the bestselling LCL course, Micro Maths PRO, for teachers and students. See above for examples of different customer reviews of this course from one of the two most popular shopping websites on the internet. For the first time this Smart eBook is available for iBooks (iPad, iPhone etc.) and all Kindles and Amazon tablets. With a Smart eBook you can tap the answers to the multiple-choice questions and it marks them. Now you can see this well-illustrated ebook in full colour. It teaches you in a quick, easy and effective way about the subjects listed. Ideal for beginners (from 8 years) to GCSE level (New GCSE too), students revising, and for work. This is Part 7 of the ebook Master Maths. Master Maths is written by a published author of many Print Books, and is based on the bestselling LCL course, Micro Maths PRO, for teachers and students. See above for examples of different customer reviews of this course from one of the two most popular shopping websites on the internet. This is Part 8 of the ebook Master Maths. Master Maths is written by a published author of many Print Books, and is based on the bestselling LCL course, Micro Maths PRO, for teachers and students. See above for examples of different customer reviews of this course from one of the two most popular shopping websites on the internet. For the first time this Smart eBook is available for iBooks (iPad, iPhone etc.) and all Kindles and Amazon tablets. With a Smart eBook you can tap the answers to the multiple-choice questions and it marks them. Now you can see this well-illustrated ebook in full colour. It teaches you in a quick, easy and effective way about the subjects listed and more. Ideal for beginners (from 8 years) to GCSE level (New GCSE too), students revising, and for work. The iBooks version had 'Surds' instead of 'Indices'. This is Part 9 of the ebook Master Maths. 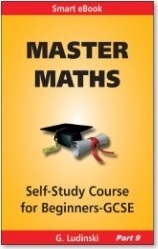 Master Maths is written by a published author of many Print Books, and is based on the bestselling LCL course, Micro Maths PRO, for teachers and students. See above for examples of different customer reviews of this course from one of the two most popular shopping websites on the internet. This is Part 10 of the ebook Master Maths. Master Maths is written by a published author of many Print Books, and is based on the bestselling LCL course, Micro Maths PRO, for teachers and students. See above for examples of different customer reviews of this course from one of the two most popular shopping websites on the internet. This is Part 11 of the ebook Master Maths. Master Maths is written by a published author of many Print Books, and is based on the bestselling LCL course, Micro Maths PRO, for teachers and students. See above for examples of different customer reviews of this course from one of the two most popular shopping websites on the internet. This is Part 12 of the ebook Master Maths. Master Maths is written by a published author of many Print Books, and is based on the bestselling LCL course, Micro Maths PRO, for teachers and students. See above for examples of different customer reviews of this course from one of the two most popular shopping websites on the internet. This is Part 13 of the ebook Master Maths. Master Maths is written by a published author of many Print Books, and is based on the bestselling LCL course, Micro Maths PRO, for teachers and students. See above for examples of different customer reviews of this course from one of the two most popular shopping websites on the internet. This is Part 14 of the ebook Master Maths. Master Maths is written by a published author of many Print Books, and is based on the bestselling LCL course, Micro Maths PRO, for teachers and students. See above for examples of different customer reviews of this course from one of the two most popular shopping websites on the internet. This tutor will really help your child with their Mathematics, as it has Smart eBook features. Colourful pictures are used on every page to teach numbers 1-50. It teaches Numbers in a quick, easy and effective way, following the new updated National Curriculum. While being a prequel to the chart-topping range of Master Maths (to GCSE) and Master Advanced Maths (to A-Level), it is also a stand-alone book. Based on the LCL course, 1st Maths course (used in schools and homes) it will open up a new world for your child, with no limits to their learning. 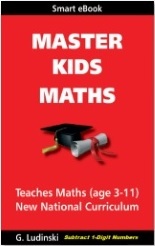 This is Part 1 of the Master Kids Maths series of ebooks. This tutor will really help your child with their Mathematics, as it is a Smart eBook. With a Smart eBook your child can tap the answers to the multiple-choice questions and it marks them. Colourful 3D pictures are used where possible, which sometimes even move to illustrate mathematical concepts. It teaches the subject listed in a quick, easy and effective way, following the new updated National Curriculum. While being a prequel to the chart-topping range of Master Maths (to GCSE) and Master Advanced Maths (to A-Level), it is also a stand-alone book. Based on the LCL course, 1st Maths course (used in schools and homes) it will open up a new world for your child, with no limits to their learning. This is Part 2 of the Master Kids Maths series of ebooks. This is Part 3 of the Master Kids Maths series of ebooks. 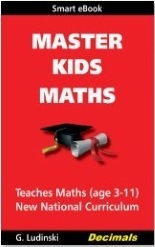 This is Part 4 of the Master Kids Maths series of ebooks. This is Part 5 of the Master Kids Maths series of ebooks. This is Part 6 of the Master Kids Maths series of ebooks. This is Part 7 of the Master Kids Maths series of ebooks. This is Part 8 of the Master Kids Maths series of ebooks. 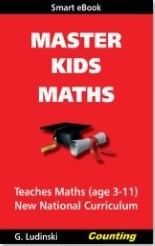 This is Part 9 of the Master Kids Maths series of ebooks. This tutor will really help your child with their Mathematics, as it is a Smart eBook. With a Smart eBook your child can tap the answers to the multiple-choice questions and it marks them. Colourful 3D pictures are used. It teaches the subject listed in a quick, easy and effective way, following the new updated National Curriculum. While being a prequel to the chart-topping range of Master Maths (to GCSE) and Master Advanced Maths (to A-Level), it is also a stand-alone book. Based on the LCL course, 1st Maths course (used in schools and homes) it will open up a new world for your child, with no limits to their learning. This is Part 10 of the Master Kids Maths series of ebooks. It covers all the times tables specified in the National Curriculum. This tutor will really help your child with their Mathematics, as it is a Smart eBook. With a Smart eBook your child can tap the answers to the multiple-choice questions and it marks them. Colourful 3D pictures are used. It teaches the subject listed in a quick, easy and effective way, following the new updated National Curriculum. While being a prequel to the chart-topping range of Master Maths (to GCSE) and Master Advanced Maths (to A-Level), it is also a stand-alone book, as important topics that are in both the National Curriculum and GCSE specifications are in both books. Based on the LCL course, 1st Maths course (used in schools and homes) it will open up a new world for your child, with no limits to their learning. This is Part 11 of the Master Kids Maths series of ebooks. It covers Shopping, Short and Long Multiplication, and Division with and without remainders. This tutor will really help your child with their Mathematics, as it is a Smart eBook. With a Smart eBook your child can tap the answers to the multiple-choice questions and it marks them. Colourful pictures are used. It teaches the subject listed in a quick, easy and effective way, following the new updated National Curriculum. While being a prequel to the chart-topping range of Master Maths (to GCSE) and Master Advanced Maths (to A-Level), it is also a stand-alone book, as important topics that are in both the National Curriculum and GCSE specifications are in both books. Based on the LCL course, 1st Maths course (used in schools and homes) it will open up a new world for your child, with no limits to their learning. 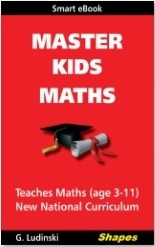 This is Part 12 of the Master Kids Maths series of ebooks. It covers Understanding fractions; Addition, subtraction, multiplication and division of fractions; and HCF and LCM. This is Part 13 of the Master Kids Maths series of ebooks. It covers Addition, subtraction and multiplication of Decimals, and Division and multiplication by 10. This is Part 14 of the Master Kids Maths series of ebooks. It covers Shapes and Angles, Areas and Perimeters, and Measures. This is Part 15 of the Master Kids Maths series of ebooks. It covers Pictograms, Handling Data, Bar Charts, and Averages. This A-Level tutor makes Mathematics easier, as it is a Smart eBook. With a Smart eBook you can tap the answers to the multiple-choice questions and it marks them. This well-illustrated ebook is in full colour. It teaches you in a quick, easy and effective way about the subjects listed. Ideal for mature beginners (up to A-Level/AS - 18 yrs level), students revising, and for work. While being a sequel to Master Maths it is also a stand-alone book, as important topics that are in both the A-Level and GCSE specifications, are in both books. It is based on the bestselling LCL course, Mega Maths, for teachers and students. See above for examples of different customer reviews of this course from one of the two most popular shopping websites on the internet. This is Part 1 of the ebook Master Advanced Maths. This A-Level tutor makes Mathematics easier, as it is a Smart eBook. With a Smart eBook you can tap the answers to the multiple-choice questions and it marks them. This well-illustrated ebook is in full colour. It teaches you in a quick, easy and effective way about the subjects listed. Ideal for mature beginners (up to A-Level/AS - 18 yrs level), students revising, and for work. While being a sequel to Master Maths it is also a stand-alone book, as important topics that are in both the A-Level and GCSE specifications, are in both books. It is based on the bestselling LCL course, Mega Maths, for teachers and students. See above for examples of different customer reviews of this course from one of the two most popular shopping websites on the internet. 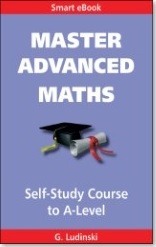 This is Part 2 of the ebook Master Advanced Maths. This A-Level tutor makes Mathematics easier, as it is a Smart eBook. With a Smart eBook you can tap the answers to the multiple-choice questions and it marks them. This well-illustrated ebook is in full colour. It teaches you in a quick, easy and effective way about the subjects listed. Ideal for mature beginners (up to A-Level/AS - 18 yrs level), students revising, and for work. While being a sequel to Master Maths it is also a stand-alone book, as important topics that are in both the A-Level and GCSE specifications, are in both books. It is based on the bestselling LCL course, Mega Maths, for teachers and students. See above for examples of different customer reviews of this course from one of the two most popular shopping websites on the internet. This is Part 3 of the ebook Master Advanced Maths. This A-Level tutor makes Mathematics easier, as it is a Smart eBook. With a Smart eBook you can tap the answers to the multiple-choice questions and it marks them. This well-illustrated ebook is in full colour. It teaches you in a quick, easy and effective way about the subjects listed. Ideal for mature beginners (up to A-Level/AS - 18 yrs level), students revising, and for work. While being a sequel to Master Maths it is also a stand-alone book, as important topics that are in both the A-Level and GCSE specifications, are in both books. It is based on the bestselling LCL course, Mega Maths, for teachers and students. See above for examples of different customer reviews of this course from one of the two most popular shopping websites on the internet. This is Part 4 of the ebook Master Advanced Maths. This A-Level tutor makes Mathematics easier, as it is a Smart eBook. With a Smart eBook you can tap the answers to the multiple-choice questions and it marks them. This well-illustrated ebook is in full colour. It teaches you in a quick, easy and effective way about the subjects listed. Ideal for mature beginners (up to A-Level/AS - 18 yrs level), students revising, and for work. While being a sequel to Master Maths it is also a stand-alone book, as important topics that are in both the A-Level and GCSE specifications, are in both books. It is based on the bestselling LCL course, Mega Maths, for teachers and students. See above for examples of different customer reviews of this course from one of the two most popular shopping websites on the internet. This is Part 5 of the ebook Master Advanced Maths. This A-Level tutor makes Mathematics easier, as it is a Smart eBook. With a Smart eBook you can tap the answers to the multiple-choice questions and it marks them. This well-illustrated ebook is in full colour. It teaches you in a quick, easy and effective way about the subjects listed. Ideal for mature beginners (up to A-Level/AS - 18 yrs level), students revising, and for work. While being a sequel to Master Maths it is also a stand-alone book, as important topics that are in both the A-Level and GCSE specifications, are in both books. It is based on the bestselling LCL course, Mega Maths, for teachers and students. See above for examples of different customer reviews of this course from one of the two most popular shopping websites on the internet. This is Part 6 of the ebook Master Advanced Maths. This A-Level tutor makes Mathematics easier, as it is a Smart eBook. With a Smart eBook you can tap the answers to the multiple-choice questions and it marks them. This well-illustrated ebook is in full colour. It teaches you in a quick, easy and effective way about the subjects listed and other Business Maths, such as Critical Path Analysis and Linear Programming. Ideal for mature beginners (up to A-Level/AS - 18 yrs level), students revising, and for work. While being a sequel to Master Maths it is also a stand-alone book. It is based on the bestselling LCL course, Mega Maths, for teachers and students. See above for examples of different customer reviews of this course from one of the two most popular shopping websites on the internet. This is Part 7 of the ebook Master Advanced Maths. This A-Level tutor makes Mathematics easier, as it is a Smart eBook. With a Smart eBook you can tap the answers to the multiple-choice questions and it marks them. This well-illustrated ebook is in full colour. It teaches you in a quick, easy and effective way about the subjects listed. Ideal for mature beginners (up to A-Level/AS - 18 yrs level), students revising, and for work. While being a sequel to Master Maths it is also a stand-alone book. It is based on the bestselling LCL course, Mega Maths, for teachers and students. See above for examples of different customer reviews of this course from one of the two most popular shopping websites on the internet. This is Part 8 of the ebook Master Advanced Maths. This A-Level tutor makes Mathematics easier, as it is a Smart eBook. With a Smart eBook you can tap the answers to the multiple-choice questions and it marks them. This well-illustrated ebook is in full colour. It teaches you in a quick, easy and effective way about the subjects listed. Ideal for mature beginners (up to A-Level/AS - 18 yrs level), students revising, and for work. While being a sequel to Master Maths it is also a stand-alone book. It is based on the bestselling LCL course, Mega Maths, for teachers and students. See above for examples of different customer reviews of this course from one of the two most popular shopping websites on the internet. This is Part 9 of the ebook Master Advanced Maths. This A-Level tutor makes Mathematics easier, as it is a Smart eBook. With a Smart eBook you can tap the answers to the multiple-choice questions and it marks them. This well-illustrated ebook is in full colour. It teaches you in a quick, easy and effective way about the subjects listed. Ideal for mature beginners (up to A-Level/AS - 18 yrs level), students revising, and for work. While being a sequel to Master Maths it is also a stand-alone book. It is based on the bestselling LCL course, Mega Maths, for teachers and students. See above for examples of different customer reviews of this course from one of the two most popular shopping websites on the internet. This is Part 10 of the ebook Master Advanced Maths. This A-Level tutor makes Mathematics easier, as it is a Smart eBook. With a Smart eBook you can tap the answers to the multiple-choice questions and it marks them. This well-illustrated ebook is in full colour. It teaches you in a quick, easy and effective way about the subjects listed. Ideal for mature beginners (up to A-Level/AS - 18 yrs level), students revising, and for work. While being a sequel to Master Maths it is also a stand-alone book. It is based on the bestselling LCL course, Mega Maths, for teachers and students. See above for examples of different customer reviews of this course from one of the two most popular shopping websites on the internet. This is Part 11 of the ebook Master Advanced Maths. This A-Level tutor makes Mathematics easier, as it is a Smart eBook. With a Smart eBook you can tap the answers to the multiple-choice questions and it marks them. This well-illustrated ebook is in full colour. It teaches you in a quick, easy and effective way about the subjects listed. Ideal for mature beginners (up to A-Level/AS - 18 yrs level), students revising, and for work. While being a sequel to Master Maths it is also a stand-alone book. It is based on the bestselling LCL course, Mega Maths, for teachers and students. See above for examples of different customer reviews of this course from one of the two most popular shopping websites on the internet. This is Part 12 of the ebook Master Advanced Maths. This A-Level tutor makes Mathematics easier, as it is a Smart eBook. With a Smart eBook you can tap the answers to the multiple-choice questions and it marks them. This well-illustrated ebook is in full colour. It teaches you in a quick, easy and effective way about the subjects listed. Ideal for mature beginners (up to A-Level/AS - 18 yrs level), students revising, and for work. While being a sequel to Master Maths it is also a stand-alone book. It is based on the bestselling LCL course, Mega Maths, for teachers and students. See above for examples of different customer reviews of this course from one of the two most popular shopping websites on the internet. This is Part 13 of the ebook Master Advanced Maths. This A-Level tutor makes Mathematics easier, as it is a Smart eBook. With a Smart eBook you can tap the answers to the multiple-choice questions and it marks them. This well-illustrated ebook is in full colour. It teaches you in a quick, easy and effective way about the subjects listed. Ideal for mature beginners (up to A-Level/AS - 18 yrs level), students revising, and for work. While being a sequel to Master Maths it is also a stand-alone book, as important topics that are in both the A-Level and GCSE specifications, are in both books. It is based on the bestselling LCL course, Mega Maths, for teachers and students. See above for examples of different customer reviews of this course from one of the two most popular shopping websites on the internet. This is Part 14 of the ebook Master Advanced Maths. This A-Level tutor makes Mathematics easier, as it is a Smart eBook. With a Smart eBook you can tap the answers to the multiple-choice questions and it marks them. This well-illustrated ebook is in full colour. It teaches you in a quick, easy and effective way about the subjects listed. Ideal for mature beginners (up to A-Level/AS - 18 yrs level), students revising, and for work. 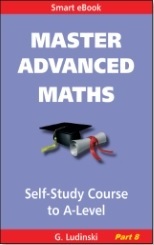 While being a sequel to Master Maths it is also a stand-alone book, as important topics that are in both the A-Level and GCSE specifications, are in both books. It is based on the bestselling LCL course, Mega Maths, for teachers and students. See above for examples of different customer reviews of this course from one of the two most popular shopping websites on the internet. This is Part 15 of the ebook Master Advanced Maths. How good is your Mathematics? This tests it and even gives you a score, as it is a Smart eBook. With a Smart eBook you can tap the answers to the quick, short multiple-choice questions and it marks them. This well-illustrated ebook is in full colour. It tests you on the subjects of every chapter in the A-Level tutor, Master Advanced Maths (complete book). Ideal for mature beginners (up to A-Level/AS - 18 yrs level), students revising, and for work. While being a sequel to Master Maths it is also a stand-alone book, as important topics that are in both the A-Level and GCSE specifications, are in both books. It is based on the bestselling LCL course, Mega Maths, for teachers and students. See above for examples of different customer reviews of this course from one of the two most popular shopping websites on the internet. This is Part 16 of the ebook Master Advanced Maths. For the first time this Smart eBook is available for all Kindles (Kindle Fire, Kindle, Kindle Paperwhite, Kindle Touch and similar). With a Smart eBook you can tap the answers to the multiple-choice questions and it marks them. It also teaches you the vital Spelling Rules in a quick and easy way. It is ideal for beginners (from 8 years) to GCSE level (New GCSE too), students revising, and anyone needing this skill for work. This is Part 1 of the ebook English Tutor. English Tutor is written by a published author of many Print Books, and is based on the bestselling LCL course, Micro English. See above for examples of different customer reviews of this course from one of the two most popular shopping websites on the internet. For the first time this Smart eBook is available for all Kindles (Kindle Fire, Kindle, Kindle Paperwhite, Kindle Touch and similar). With a Smart eBook you can tap the answers to the multiple-choice questions and it marks them. It also teaches you Irregular Spelling in a quick and easy way. It is ideal for beginners (from 8 years) to GCSE level (New GCSE too), students revising, and anyone needing this skill for work. It covers: Spelling by Pictures, Elementary Spelling, Intermediate Spelling and Advanced Spelling. This is Part 2 of the ebook English Tutor. English Tutor is written by a published author of many Print Books, and is based on the bestselling LCL course, Micro English. See above for examples of different customer reviews of this course from one of the two most popular shopping websites on the internet. For the first time this Smart eBook is available for all Kindles (Kindle Fire, Kindle, Kindle Paperwhite, Kindle Touch and similar). With a Smart eBook you can tap the answers to the multiple-choice questions and it marks them. It also teaches you the vital Punctuation Rules in a quick and easy way. It is ideal for beginners (from 8 years) to GCSE level (New GCSE too), students revising, and anyone needing this skill for work. This is Part 3 of the ebook English Tutor. English Tutor is written by a published author of many Print Books, and is based on the bestselling LCL course, Micro English. See above for examples of different customer reviews of this course from one of the two most popular shopping websites on the internet. For the first time this Smart eBook is available for all Kindles (Kindle Fire, Kindle, Kindle Paperwhite, Kindle Touch and similar). With a Smart eBook you can tap the answers to the multiple-choice questions and it marks them. It also teaches you English Grammar and Spoken Language in a quick and easy way. It is ideal for beginners (from 8 years) to GCSE level (New GCSE too), students revising, and anyone needing this skill for work. This is Part 4 of the ebook English Tutor. English Tutor is written by a published author of many Print Books, and is based on the bestselling LCL course, Micro English. See above for examples of different customer reviews of this course from one of the two most popular shopping websites on the internet. For the first time this Smart eBook is available for all Kindles (Kindle Fire, Kindle, Kindle Paperwhite, Kindle Touch and similar). With a Smart eBook you can tap the answers to the multiple-choice questions and it marks them. It also teaches you the skills you need to write good English in a quick and easy way. It is ideal for beginners (from 8 years) to GCSE level (New GCSE too), students revising, and anyone needing this skill for work. This is Part 5 of the ebook English Tutor. English Tutor is written by a published author of many Print Books, and is based on the bestselling LCL course, Micro English. See above for examples of different customer reviews of this course from one of the two most popular shopping websites on the internet. * = This price is approximate as it depends on exchange rates.